I had stopped in this wine and beer shop on my way home from work yesterday to pick up a six-pack of Mahou, a Spanish beer I have been dying to find since I had one on a very hot afternoon in Salamanca years ago, and as usual, I had the Rolleiflex around my neck. The owner’s eyes lit up when he saw it and we had a long chat about photography in between his customers. I mentioned that I do all my own darkroom work, both black-and-white and color. He remarked that he never did get into color, but was very much in love with black-and-white. This brought to mind the old Edward Weston quote, “there are things you can say in color that you can’t say in black-and-white”. Very true- the two media have different emotional resonance frequencies. This photo is a great example of the difference. It’s a cute scooter that when photographed in color, is white with a medium-blue splash on the rear fender, and reads as cheerful and fun. 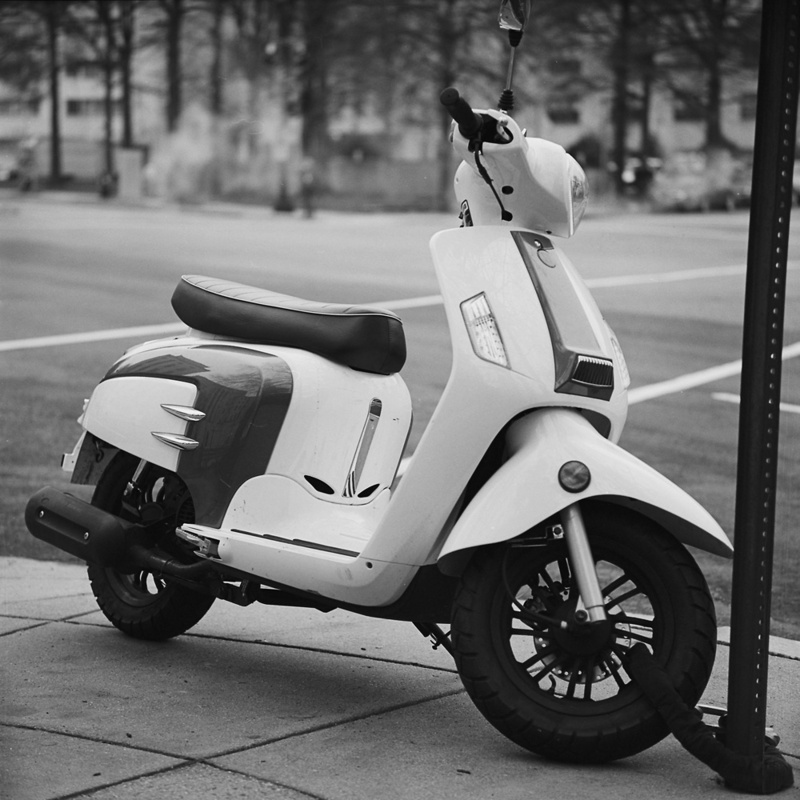 In black-and-white, it has a much more serious edge to it, and it reads almost macho, for a scooter. Like a member of the Sons of Anarchy wouldn’t feel compelled to commit suicide if forced to ride it. Thus the semi-ironic caption – “badass scooter”. No scooter ever really is menacing, but in black-and-white, this one is respectable at least. I’m sure some of my motorcycle enthusiast friends will disagree with me on this and tell me in no uncertain terms that it is impossible for a scooter to be butch. This was also a lens test of sorts for my new-to-me 1959 Tele-Rolleiflex. I wanted to see not only how smooth the out-of-focus areas are with it, but how much telephoto perspective compression it gives – the “3-D effect”, in other words. I’d say it pops more than the standard, but it’s still subtle as the lens is not even twice the focal length of the Standard lens (135mm vs 80mm for the standard). Previous PostLion-head Bollard, Pennsylvania AvenueNext PostIntro to Large Format Photography @ Glen Echo – Sold Out!